Restaurant projects offer interior designers and architects interesting opportunities for experimentation, and here is a look at the latest new restaurant projects covered in Floornature. 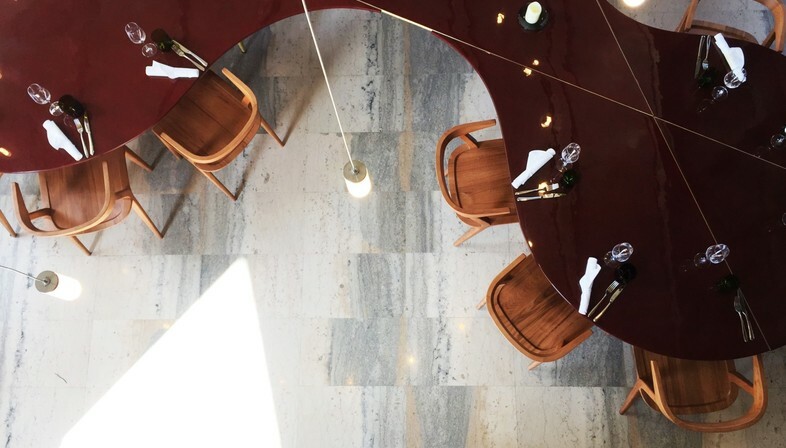 We start with a restaurant that is three in one, "dining in three acts" as architect Lina Ghotmeh describes it, referring to the three different ways of "being at the table" offered by her project: Les Grands Verres, the restaurant in the Palais de Tokyo in Paris. Another restaurant with a dual soul is St. Petrus in Riga, Latvia, designed by Annvil , combining a casual bistro and gastro-bar with a refined, luxurious restaurant. In Indonesia, Alvin T offers some interesting experiments combining traditional Indonesian forms and elements with features of contemporary design, as in the pop coffee shop Colette & Lola. A restaurant with a completely different atmosphere, both rustic and refined, is Cruo, designed by Spanish studio Persevera Producciones in Seville. Hand craftsmanship, industrial production and colours inspired by nature appear in Snøhetta’s interior design project for Barr, a new night spot on the seashore in Copenhagen. And in the future... Snøhetta will also be designing Under, Europe’s first underwater restaurant. We conclude with an overview of new proposals in which porcelain surfaces for floors, walls, counters and kitchen worktops play an important role in the customisation of spaces.